If you're in a position to review this paperback edition, and would be interested in receiving a review copy of it upon publication, drop me an email - david at continuum-books dot com. Bob Dylan was one of the greatest insperations to music, period. wow thats a pretty long list there. Bob Dylan is not only among the greatest in folk-rock, he is one of the greatest poets of all time. Very nice. Obviously, I'll have to get this -- though I've only had my first edition for about a year. Of course, a book like this is a living thing, as long as the author is, so it isn't really finally bought as much as subscribed to. Is an upgraded CD-ROM going to be included in the new edition? Hi there. Thanks for the nice comments! 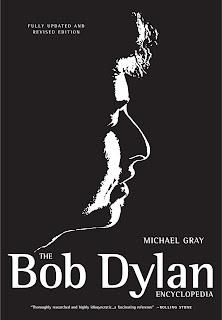 The paperback edition of the Bob Dylan Encyclopedia will not have the CD-ROM included. But it WILL be considerably less expensive than the hardcover as a result. As for 33 1/3, I'm afraid it doesn't go back to Socratic mind control, or maybe it does? It's the number of revolutions per minute an LP makes on a turntable. Who would have thought that there is so much on the master. I love Dylan's work! i sure wish bob could write more sci-fi material.it seems like yesterday he wrote knocka knacka knockin on heavens door, prety woman, strange, and hound dog.i remember the first book he wrote was a sci-fi thriller, i think it was just after lay lady lay. by the way,does anyone know if glen campbell has made any westerns since 'true gritts'? just curious.